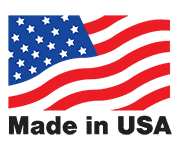 Made in the USA... What does it mean at Hoyt Electrical Instrument Works? 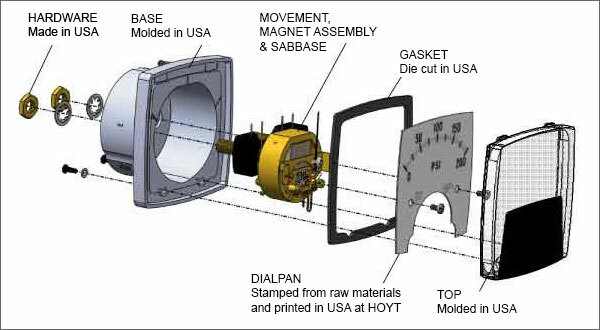 An American made analog panel meter consists of four main parts or subassemblies. We are keeping it simple for this explanation as there are 30 parts just in the meter movement alone. We won’t overwhelm you with the balance fan, cross arm, support bridge, manganin shunt, zero lever, hairspring, and the several other parts that we make from raw materials supplied from USA vendors. We have provided a SolidWorks model below so it’s easy to follow along if you know little about analog panel meters. Base: Hoyt analog panel meters are made from brass, steel, abs, and phenolic. For those that are not familiar with Phenolic, it’s a trade name for a resin or synthetic polymer used to make several different types of plastic. The raw material used to make these bases is supplied by four main vendors located in the United States. We stamp several of the metal bases in house at Hoyt to this day. Movement:Analog meter movements are the heart and soul of every meter. Hoyt uses six main types of movements on USA made meters depending on the input signal and customer application. #19 DC Movement: Completely shielded pivot and jewel high torque movement with high density sintered iron ring, strong Alnico V Bar magnet, and standard 100° swing of the coil. #22 DC Movement: Essentially the same as a #19 movement for smaller sized meters that require a less powerful magnet. #17 External Magnet: These 2% accurate movement are built on the D’Arsonval principle with selected jeweled bearings, hardened pivots specially cemented and baked to short-proof anodized coil forms for trouble free life. AC Repulsion Movement: Hoyt AC movements are manufactured with a brass support to match the element. This feature enable a Hoyt AC meter to maintain accurate readings over a wider temperature band. 250 Degree Movement: Hoyt patented 250 degree movement is self-shielded pivot and jewel meter. Features a mechanically interlocked construction with very high torque and the movement is good down to 200 microamps. Taut Band Movement: Moving mechanism is suspended between two pieces of metal therefore eliminating the needs for pivots, jewels, and springs found in our traditional meter. They are great for applications where extreme sensitivity is required. Dial Pan: The material for the dial is either aluminum or Lexan and is supplied by a US manufacturer. We stamp the dial pan in house to the specific shape required for the sub-base assembly. Printing is handled in house through pad printing or traditional offset method using clichés. The raw clichés and ink are sourced through a vendor in Vermont. Dial artwork for special ranges, colors or logos is handled at Hoyt using Adobe Illustrator. Top: Hoyt uses clear polycarbonate plastic or glass to ensure maximum visibility and durability. 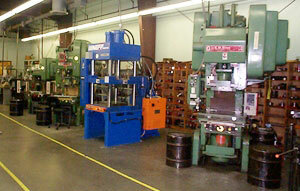 They are supplied by three main New England vendors that have provided decades of excellent service. 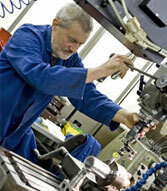 All the labor to put these components is performed right here in Penacook, NH. 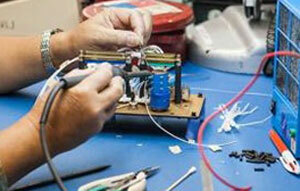 This includes the final processing steps below for each meter calibration, final QC, packaging, and shipping. You will notice throughout the website the Made in USA statement included in the meter header title and description. For example, the 5000 Series, 3100 Series, or 250 Series to name a few. Now you know what it means at Hoyt. We take pride in this fact and not many manufacturers can say they produced a product in the USA for for over a hundred years.